It used to be that weather extremes were “proof of man-made warming”. But because that argument didn’t seem to sway anyone, the warmists have taken it a level higher: now even the storm’s path is proof. This is how desperate they’ve become. Thirty years ago, such people would have been committed to a nuthouse. Chart Source: NOAA, modified by NoTrickZone. 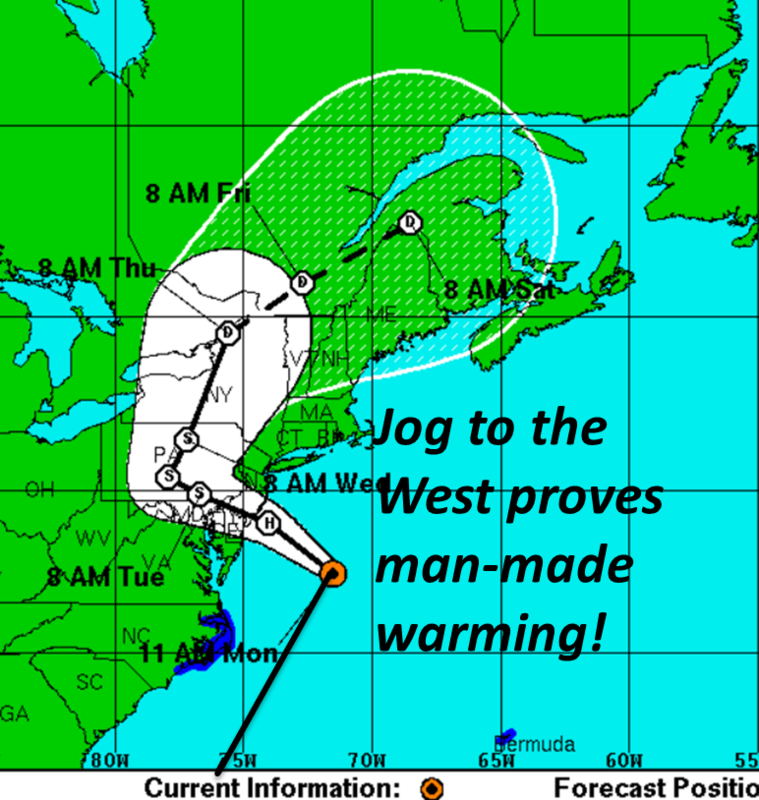 Normally nor’easters more or less follow a path parallel to the East Coast. But this time Sandy took a sharp turn westwards into New Jersey before heading north again. If Sandy had followed the usual path, it would have left the East Coast pretty much unscathed and the storm would have been considered “normal” and gone by more or less unnoticed; everyone would have yawned. But Sandy made a jog to the west, and now the warmist bedwetting media jackasses are freaking out seriously, hailing it as irrefutable proof of man-made climate change, dubbing it a “mega-storm“, “superstorm“, “monsterstorm“, … a “Frankenstorm“! All because of a jog in its path. The warmists are seriously grasping at any straw. The barometer has gotten that low for them. He who has decreed the seas will stop rising on his watch has now decreed an extraordinary effort will be made to make every thing right in short order – there’s an election, you know. Of course, it will be the wealth of the nation and the training of its various crews that clean up the mess. There are a great number of people at risk and tremendous value in the infrastructure, businesses, and so on. Much should not have been built where it has been. Previous storms have made landfall in this region and this will be added to the “historic” list. It wasn’t called a superstorm or megastorm or whatever because it turned left. It was dubbed those things in the media because when it turned left, it ran into a winter storm coming in from the west and cold air coming down from the arctic. In some areas it created some intense weather that would not have happened if any of these conditions happened by themselves. Also, i read 2 of the articles you linked to, and niether one of them mentioned global warming. Why is that? Just take this one instead.